One of the beautiful display cases that are part of the MSP National Arts Program® show which is hung in the Thomson Reuters Concourse C Art Gallery. The Fifth Anniversary NAP Exhibit in Minneapolis St. Paul International Airport is currently on display in their Thomson Reuters C Concourse Art Gallery. The show which runs through April 16th includes 125 works from the employees and their family members. Mackenzie Owens is the new coordinator for the MSP show and she did a wonderful job of keeping the positive momentum going. Although participation was down slightly from the previous year, the attendants gave rave reviews and commented that this show looks even better than the last. One of the highlights of their reception, which took place on December 5th, was the attendance of so many officials. As usual there was strong support from both the airport and community leadership including, Jeff Hamiel MSP Executive Director and CEO, Jana Vaughn AFMSP Executive Director, Robyne Robinson AFMSP Director of Arts & Culture and many more. The estimated 175 attendees at the reception were also treated to catering and live music creating a celebratory atmosphere for all. 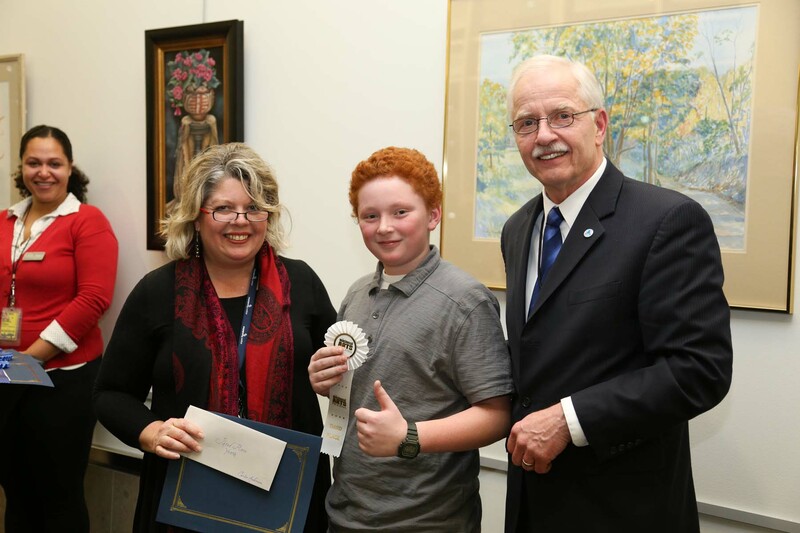 Jana Vaughn, Executive Director of the Airport Foundation MSP and Jeff Hamiel, Executive Director and CEO of the Metropolitan Airports Commission pose with Youth Artist Carter Anderson, who took home the Third Place Prize for his painting entitled ‘Base Hit’.